Madeleine Altimari is a smart-mouthed, rebellious nine-year-old who also happens to be an aspiring jazz singer. Still mourning the recent death of her mother, and caring for her grief-stricken father, she doesn't realize that on the eve of Christmas Eve she is about to have the most extraordinary day—and night—of her life. After bravely facing down mean-spirited classmates and rejection at school, Madeleine doggedly searches for Philadelphia's legendary jazz club The Cat's Pajamas, where she's determined to make her on-stage debut. On the same day, her fifth grade teacher Sarina Greene, who's just moved back to Philly after a divorce, is nervously looking forward to a dinner party that will reunite her with an old high school crush, afraid to hope that sparks might fly again. And across town at The Cat's Pajamas, club owner Lorca discovers that his beloved haunt may have to close forever, unless someone can find a way to quickly raise the $30,000 that would save it. Together, Madeleine, Sarina, and Lorca will discover life's endless possibilities over the course of one magical night. 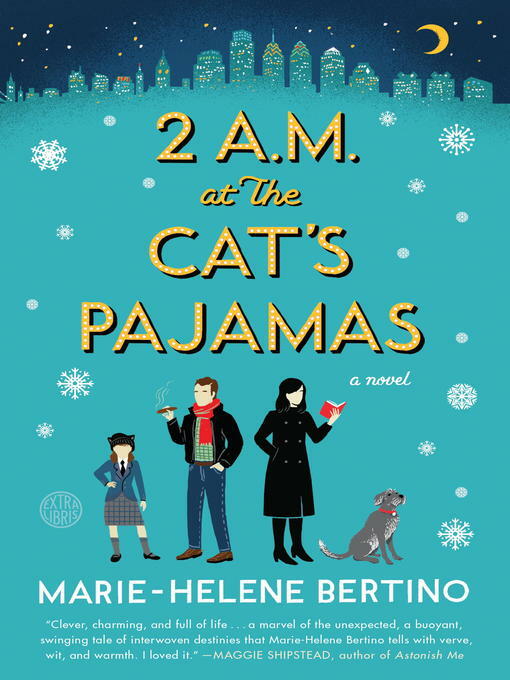 A vivacious, charming and moving debut, 2 A.M. at The Cat's Pajamas will capture your heart and have you laughing out loud.